Considered individually, the detailed stories of opium smuggled into China, Chinese porcelain, and clipper ships are interesting. However, the intent of this brief account is merely to highlight a few linkages that tie these histories together. Let’s start with clipper ships. American clipper ships, similar to the Ann McKim below, were designed primarily for speed. The first such ships originated in the Chesapeake Bay and were referred to as “Baltimore clippers.” Between 1833 and 1858, numerous other clippers were built in American ports from Maryland to Maine. Many of these ultimately brought tea from China to America. The design of the sleek clipper ship allowed it to cut through heavy seas and strong head winds; they excelled at this. The bows were sharp, hulls narrow and V-shaped, masts strongly raked, and canvas sails extensive. Obviously, the wider and longer competitor ships could carry more cargo. However, the importance of speed outweighed cargo size when it came to the transport of tea and opium. Long voyages reduced the freshness of tea and lowered its sale price; speed increased it. The supply of opium was low in China just before its harvest time in India. So, the ships reaching China the quickest reaped the greatest reward. Clipper ship speed made some of the American ship captains wealthy. Clippers could sail at least 250 miles/day whereas larger, less streamlined sailing ships could only cover 150 miles. Charmer, Comet, Hurricane, Rainbow, Sea Serpent, Water Witch, and Wild Pigeon are just a few of the colorful names given to these fast ships. Figure 1: The clipper ship Ann McKim, 1833, built at Fells Point, Baltimore, Maryland. (Photo by W.E. Parham, 2017). Because a tea cargo was relatively light weight, it was not suitable for ballast, and that’s where porcelain enters the story. In China’s early history, they had learned how to make porcelain, a durable product even when submerged in water. Porcelain ware (vitreous China) was readily available in south China port cities. Raw materials needed included kaolin clay, decomposed feldspar, and quartz, all derived from south China’s degraded countryside that was composed of deeply weathered granite bedrock. Once the ingredients were ground and blended properly with water, the clay-rich material could be shaped into plates, cups, bowls and a variety of art objects. When the ware was kiln fired at about 1200 degrees C (~2200 degrees F) the color of the final dense product was white. The sea captains found that porcelain ware worked well as ballast. So, they purchased large amounts of it for their ships. When the tea cargo was sold in America, the ballast (porcelain ware) also found a ready market with the local people who liked its special qualities and beauty. Chinese artisans at that time produced a common, blue and white porcelain ware that generally showed scenes of the Chinese gardens, farm life, dragons, etc. Cobalt was used to paint the pictures and patterns on the ware and, when kiln fired, it produced its well known blue color on a white background (Figure 2.) Over time, such porcelain ware became widely known outside of China just as “China.” The demand for Chinese porcelain ware expanded and provided new opportunities for Chinese artisans to make custom porcelain ware for export. The Chinese had little interest in buying foreign products themselves yet they were happy and eager to receive their tea payments in silver. As a result, silver flowed into China while tea flowed out. In time though, a product surfaced that the Chinese did want to buy, one that the British and American traders believed would reverse the direction of the flow of silver. That product was opium, even though it was illegal in China. That brings us back to the third aspect of this history, the history of opium smuggling. The United States, to compete with Britain’s monopoly of Indian opium, sent ships to Turkey to buy opium. The Americans then smuggled it into China in part by bribing local officials. Britain and the United States were only two of many countries that smuggled opium into China. France, Denmark, and Sweden, among others, also participated. However, in 1833, Britain removed the East India Company’s trade monopoly and American traders took advantage of the new source of opium. American clipper ships during the 1830s, brought increasing amounts of Indian opium to China’s south coast where it was smuggled ashore. Some estimates say the amount may have reached as much as thirty percent of all of the smuggled opium entering China during this period. Many American opium traders made fortunes in just a few years. Later, some of them used their new wealth to support well known American universities like Harvard, Princeton, and Brown. In addition, many opium traders and opium sea-captains built mansions along America’s north-east coast, some of which still exist. Two are shown in Figures 3 and 4. Figure 3. R.B. Forbes House, Milton, MA. (Credit: miltonscene.com). Figure 4. S.W. 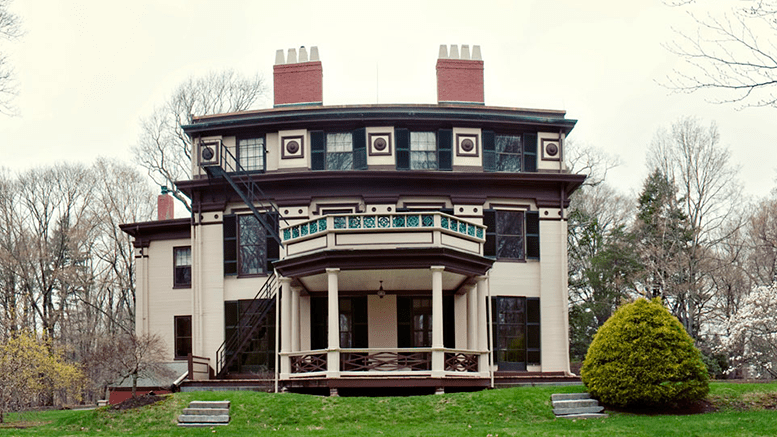 Russell House, Middletown, CT. (Credit: Wikipedia). China became increasingly concerned with opium’s adverse effects on its people. Their Emperor tried numerous times to stop the smuggling unsuccessfully. Ultimately the contested opium-trade led to two military conflicts between Britain and China, i.e. The Opium Wars. Britain was victorious in both wars which prolonged China’s opium addiction problem. But that is another topic, so let’s stop here.